Home to hipster cafés, trendy bistros and Korean barbecue joints — interspersed by a gazillion bridal studios, so one can drool over good food and gorgeous gowns at the same time — Tanjong Pagar has always been one of our favourite foodie haunts. 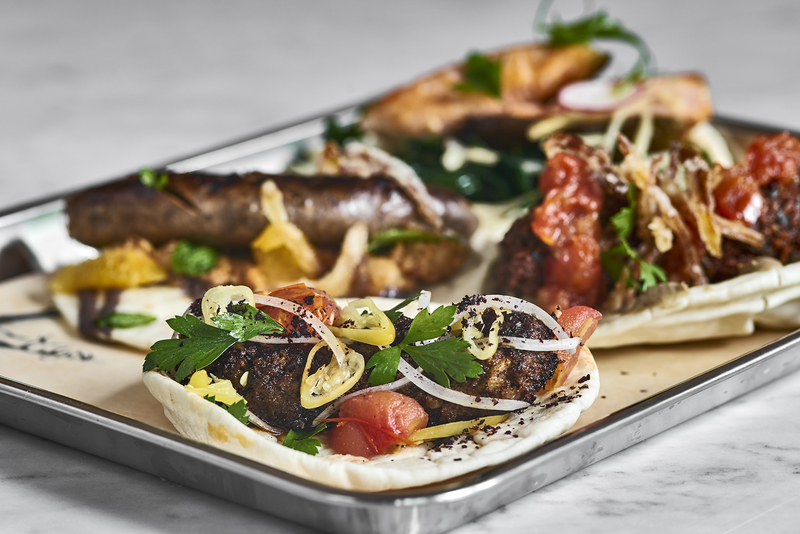 The newest entrant to the neighbourhood is Turkish restaurant Fat Prince, opened by management group The Dandy Partnership, which also runs izakaya Neon Pigeon along Keong Saik Road. Fat Prince boasts lavish, immaculately furnished interiors. 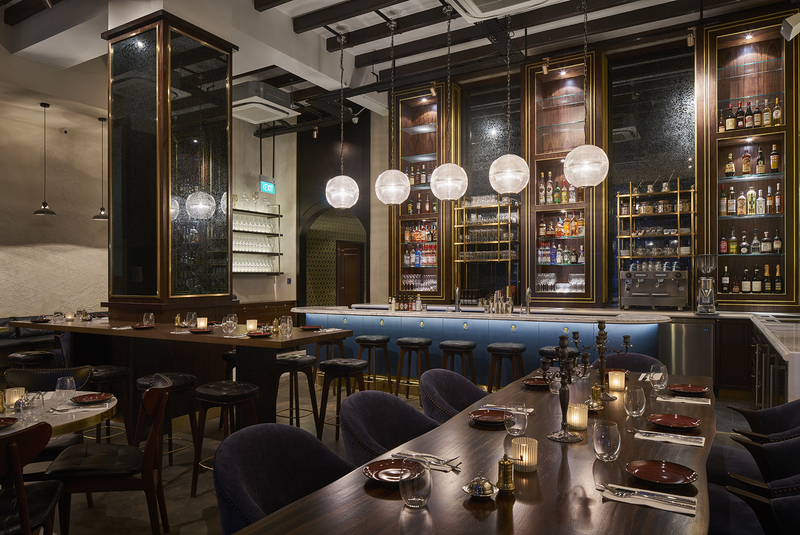 Located along Peck Seah Street, Fat Prince is a luxurious space clad in wood and earth tones, with splashes of blue and gold. Its interior design is inspired by the vibrant neighbourhood of Karaköy in Turkey, and features high ceilings, sturdy wooden rafters and elegant pendant lamps. The restaurant’s walls are also adorned with mosaic patterns, which have been deliberately left unfinished to create the setting of an age-old empire. 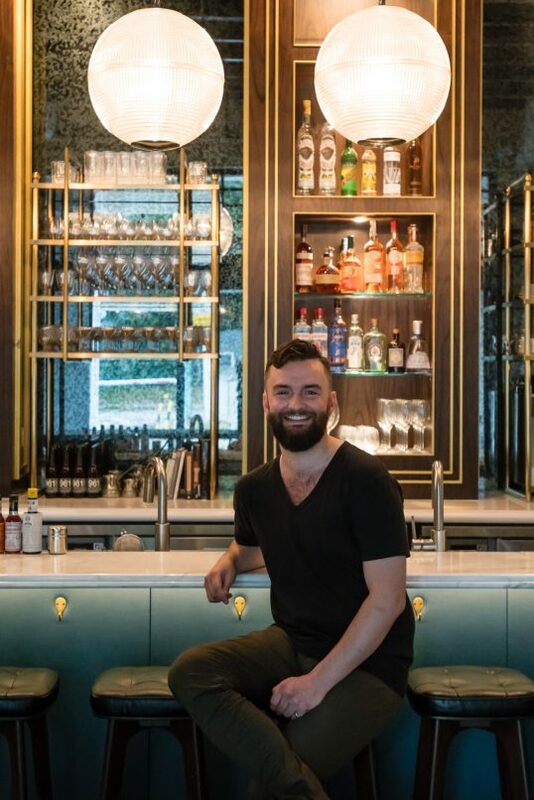 The restaurant is also equipped with a handsome marble-topped bar, where patrons can knock back cocktails, Jordanian beers and regional wines from Lebanon and Morocco. The bar also showcases cezve (small Turkish coffee pots) and a sand pit, which are used to make traditional Turkish coffee. If that’s not enough Ottoman detail, even the bathrooms are fitted with lovely hand-painted, Istanbul-imported ceramic bowls as sinks. Canadian chef Hunter Moyes helms the kitchen at Fat Prince. Fat Prince focuses on New Middle Eastern cuisine, with a repertoire of kebabs, salads and sides such as hummus. Its kitchen is headed by Canadian chef Hunter Moyes, who previously helmed Tacofino in Vancouver. We kickstarted our meal with the Turkish Kisir (S$14), a traditional herb salad of chewy bulger wheat, roasted tomatoes, parsley and spicy Turkish pepper paste. Aromatic and tangy, it was the perfect start to our feast. Equally tasty was the quinoa tabbouleh (S$14), a nutritious combination of red quinoa, cherry tomatoes and onions. Bits of pomegranate scattered throughout the bowl helped inject bursts of sweetness, while mint and long leaf parsley perfumed the mix with a pleasing fragrance. 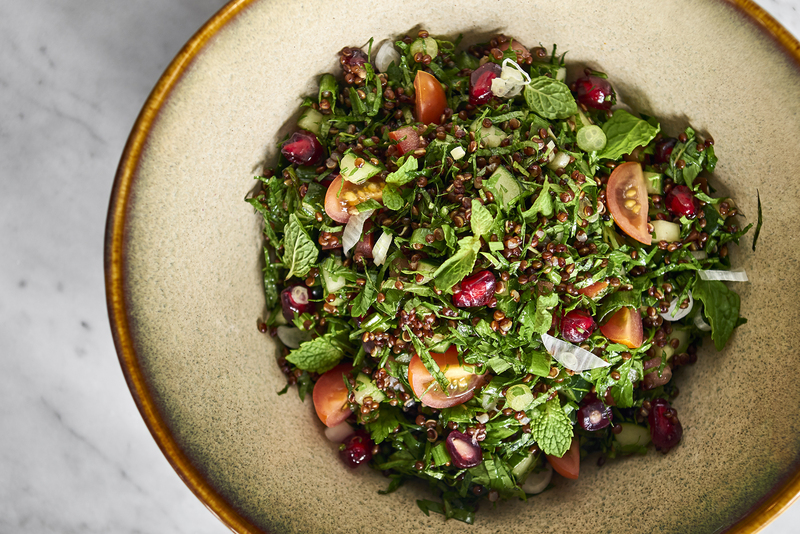 The restaurant’s healthy options include this tasty quinoa tabbouleh. With our veggie quota for the day well fulfilled, it was time for some meatier (and less healthy) fare. We dug into Moyes’ rendition of hummus (S$11), a gleefully indulgent concoction that incorporated duck fat into the traditional recipe of chickpeas, garlic and lemon juice. The fat contributed a richness and creaminess to the overall texture, and imbued its nutty flavour with a slight saltiness. We couldn’t resist smearing generous dollops of it onto the accompanying pita bread, which was thinly sliced and baked till crisp. Duck fat in hummus? Yes please. After wolfing down all that artery-clogging goodness, we moved on to the restaurant’s signature kebabs (two for S$16, three for S$24), which we greedily ordered in three flavours: Spicy prawn, smoked kaşar cheese and spicy beef. They came wrapped in large, taco-sized pieces of pita bread, which Moyes sourced from a bakery along Arab Street. Our favourite was the kaşar cheese kebab, which was stuffed with a massive chunk of salty cheese glazed with sticky-sweet pomegranate vinaigrette and sprinkled with crunchy candied almonds and cashews. It was comfort food at its finest, with its melange of sweet, salty and nutty flavours that worked wonderfully together. We tore into the spicy and juicy beef kebab with gusto. Also scrumptious was the spicy prawn — which we liked for its springy prawns and sour slivers of chayote (a type of gourd) and pear — and the beef kebab, a piquant medley of smoked tomatoes, pickled chilli, macerated onions and succulent meat, which was deliciously smokey and slightly charred from the charcoal grill. 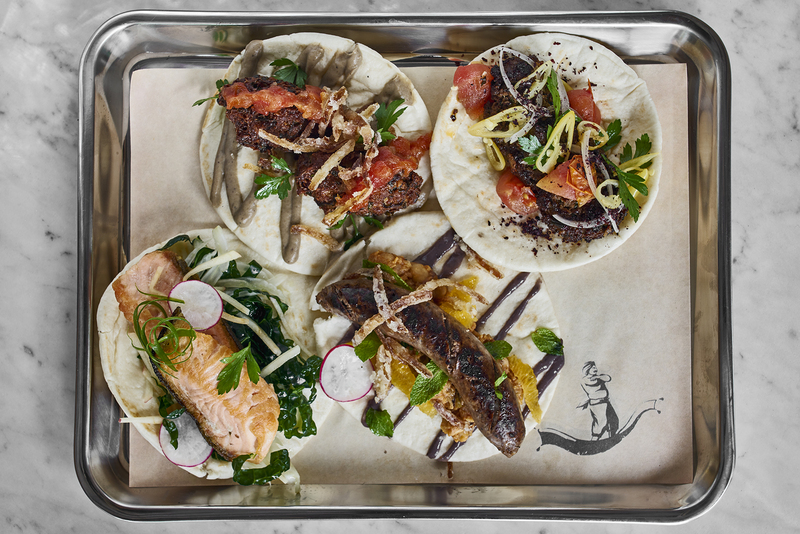 Other mouthwatering flavours on the kebab menu include seared salmon, honey chicken and pork. The menu seems a little limited for now, but Fat Prince plans to expand its repertoire next month with a selection of meze (Turkish tapas-style dishes) such as okra falafel. Fat Prince’s kebabs come in various flavours such as seared salmon and spicy prawn. Fat Prince is in the quieter part of Tanjong Pagar that doesn’t see much visitor traffic, but we’re sure it’s just a matter of time before it starts to pull the crowds. After all, it’s sitting on a really promising spot right across the upcoming Tanjong Pagar Centre, which is slated to open later this year. Currently under construction, the mixed-use building will be Singapore’s tallest skyscraper at 290m, and will house office spaces, residences and retail concepts. Another exciting aspect of Fat Prince is its sister dining concept The Ottoman Room, which is connected to it by a large archway. 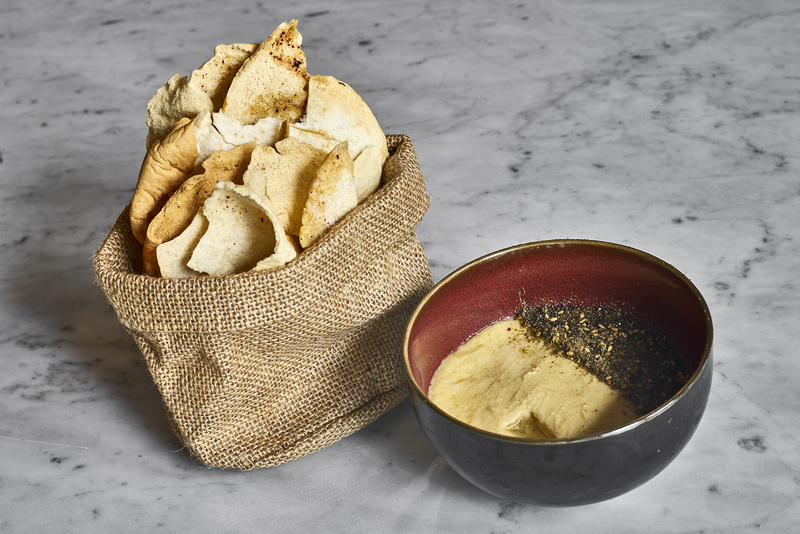 Scheduled to launch next month, The Ottoman Room will serve weekend brunch and, during dinner time, a menu focusing on meze such as vine-leaf confit duck wraps and various types of hummus. It will also be available for private events.